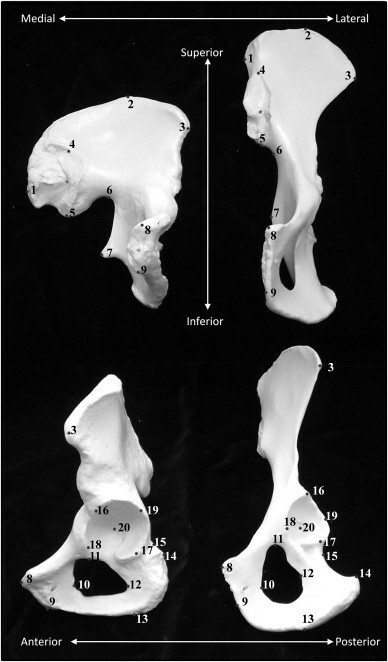 Comparative studies of catarrhine pelvic morphology in an evolutionary framework play an important role in paleoanthropology, especially since this is the context from which human bipedalism eventually arose. Given the abundance of potentially confounding evolutionary and mechanical factors influencing pelvic form, it is important to tease apart the effects of shape and size in the major component of the primate pelvis, the os coxae. However, os coxae form is difficult to assess via traditional morphometric methods. Here, we adopt a 3D geometric morphometric approach to landmark data. Our analyses included data from 30 extant catarrhine taxa. Data were transformed and registered using Procrustes analysis and analyzed via examination of principal components. Two analyses were performed: one excluding Homo sapiens, and a second including them. Results of the first analysis demonstrate that the total diversity of os coxae morphology is significantly greater in hominoids than it is in cercopithecoids. This appears to be driven by the greater effects of size diversity (i.e., allometric effects) in the case of the hominoids. This analysis also revealed a clear taxonomic/phylogenetic distinction between hominoids and cercopithecoids in terms of os coxae shape. The second analysis showed that Procrustes distances in shape space are significantly greater between extant Pan and Homo than they are between any two non-human catarrhine taxa. This analysis thus quantifies, on a comparative basis, the dramatic effect that the course of hominin evolution had upon the morphology of the human pelvis, within what is – even by catarrhine standards – a relatively short span of evolutionary time. Figure 1. Anatomical locations of the 20 pelvic landmarks captured for each specimen as illustrated on a human (left) and chimpanzee (right) os coxae model. Given that standard anatomical orientations (e.g., superior, inferior, etc.) differ between humans and other non-human primates due to positional behavior, the orientation terms employed in the list of landmark definitions (Table 1) refer to analytical orientations as shown in this figure. Here superior and inferior are used instead of ‘cranial’ and ‘caudal’ respectively, and anterior and posterior instead of ‘ventral’ and ‘dorsal’, respectively. Figure 4. 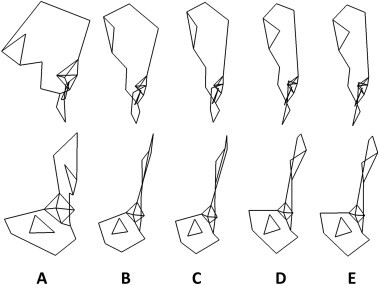 Wireframes depicting the average shapes of humans (A), great apes (B), small-bodied apes (hylobatids) (C), cercopithecines (D) and colobines (E) in frontal (upper panel) and lateral (lower panel) view.